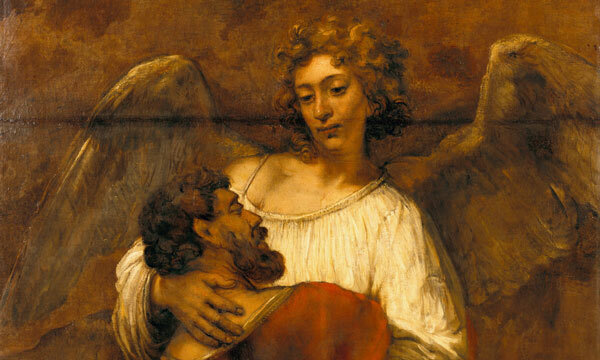 ‘Jacob Wrestling with the Angel,’ by Rembrandt Harmenszoon van Rijn, circa 1659-60. We might ask, how could pursuing social justice be a satanic temptation? For now, it is enough to say that if the possibilities Jesus encounters are not attractive, there would be no temptation. Nonetheless, Jesus rejects turning stones into bread. nity of power and prestige. The second temptation represents an invitation to adopt a “realistic” perspective, to slip into seeing the world as others do—to concede that seizing the reins of political or even military power is necessary in order to change things. Jesus responds to this offer by insisting that worship and service are due the Lord alone. In so doing, Jesus rejects the very real, and scripturally supportable, possibility of being a domineering Messiah, en route to becoming another pharaoh himself. The devil again challenges Jesus: “If you are the Son of God, throw yourself down,” and the angels will catch you. Here, Satan invites Jesus to claim special divine protection. As the Messiah, Jesus would be free from pain and experience “messianic immunity.” Although we could also find substantial scriptural backing for such a perspective, Jesus rejects this special, untouchable status as a temptation. The devil offers Jesus several messianic shortcuts: be a social justice miracle-worker, be “realistic” and seize the reins of power, claim messianic immunity along with your special status. And Jesus rejects them all. But to consider how Jesus responds, let us turn from a rhetorical struggle to a physical one: the account of Jacob wrestling at the Jabok River (Genesis 32:23-32). Second, while this encounter results in a blessing, it is not automatic, but rather the result of contention and determined effort. Although the struggle takes all night, Jacob refuses to let go until he receives a blessing. Finally, Jacob does not emerge from this experience unscathed, but bears a physical wound along with a change in identity. Israel’s encounter proves so intense that he will never be the same again. Every time he picks up his cane he is reminded of this moment. Where Jesus struggles with the devil over his identity, Jacob wrestles a stranger. Indebted as I am to Tom Yoder Neufeld among others, I have come to greatly appreciate this passage as a striking analogy for studying Scripture. Like Jacob, we find ourselves confronted with what appears to be a very human wrestling partner. In the Bible we encounter at times elegant language and at others an earthy witness to the divine. Where we might wish for a Bible that seems utterly consistent, answers all of our questions and contains no embarrassing features, this is simply not the Scripture we have. And I, for one, thank God for this. If it were not so, if the Bible were perfect, it would be too unhuman, an alien entity removed from earthly life with little connection to our frustrations and struggles. At the same time, the church has found from the beginning that we encounter God through this Scripture. Although Jacob wrestles a man, he also experienced a divine encounter and names the place Peniel (“the face of God”). But this happens in retrospect; only after wrestling with “a man” does Jacob recognize that he has encountered God. Just so, grappling with the very human words of Scripture we have the opportunity to look back and recognize our own encounter with the divine. But wrestling with Scripture is not automatic. Jacob struggled and refused to let go; like a dog with a bone, he persisted until he emerged with a blessing. Likewise, biblical interpretation requires effort, tenacity and persistence. And frankly, some texts or topics present more of a struggle than others to emerge with a blessing. But, like Jacob, our challenge is to refuse to let go—to commit to this struggle—until we emerge with a word of God for our own time. Finally, wrestling with God is risky. In the church we do not ultimately read the Bible as an academic exercise, but to hear a message of God for our lives together. The risk, of course, is that we just might find one! Studying the Bible may profoundly affect and even transform us. And like Jacob, who bore a limp for the rest of his life, we might bear the evidence of this encounter with God long into the future. Returning to Luke with this analogy in mind, we see that the struggle for Jesus’ identity hinges precisely on finding the word and will of God through the Bible. Three times the tempter confronts Jesus, and three times Jesus answers with Scripture, from Deuteronomy. While Jesus does not reject “social justice” per se, he does qualify such a concern. The key word here is “alone”: “One does not live by bread alone.” Providing physical nourishment is important, but it is not everything. In our own day it remains a temptation for the church to concentrate solely on “material need,” to see ourselves as one more amidst a sea of social agencies that “do good things.” Providing food to the hungry is very important, but this is not all the mission of God entails, or all the church is about. Feeding on the “Word” is crucial, and it is this prior commitment that allows Jesus to navigate the temptations he faces. Even more interesting, the devil himself also quotes Scripture here. While we wouldn’t think twice about using Psalm 91—one of my favourites that we often use as a call to worship—here this passage is employed by the devil. This is worth pondering. Some Christians assume that if we can only find a verse that provides a scriptural “answer” to a specific question, then our job is done. Taken to the extreme, the Bible can function as a glorified game of “Whack-a-mole,” where questions pop up and our job is to smack them down, one by one, with the appropriate verse. Jesus’ temptation provides a drastic warning for such a view. Here Scripture is not only misused, but used satanically! To be clear, I am not calling this or any other passage of Scripture satanic. But even Scripture itself can be abused in a way that obscures God’s will, rather than reveals it. So, where one temptation today lies in assuming that we can cite a favourite verse to stop discussion, the opposite temptation is to give up on interpretation or the Bible itself altogether. “You can make the Bible say anything,” we might say, and then stop reading it. Or we may reference parts of the Bible, but treat it as secondary literature alongside The Da Vinci Code, Shelby Spong, the Charter of Rights and Freedoms, or even The Naked Anabaptist. proaches fundamentally agree on this, and in so doing both step away from the fundamental basis that grounded Jesus’ identity and ministry. As Jesus’ temptations reflect, quoting Scripture is not the end of a discussion, but the beginning of one. What’s more, this is never a task that is done once and for all: “the devil departed from him until an opportune time.” In other words, debate continues, and so does temptation. I affirm the historic Mennonite emphasis on seeing Jesus as our example, and am grateful for how this has led to an emphasis on social justice, peace and the importance of community. However, unhitched from a commitment to engage the Bible, concern with “social justice” can soon become pragmatic realism; “peace,” something we advance ourselves; and “community” potlucks among like-minded individuals of a similar social strata. While not bad things, it is less clear how our Christian identity informs them in a meaningful way. Put simply, what makes the church different than the “United Way” or a “Rotary Club” in its pursuit—indeed, its definition—of such things? Jesus’ identity and ability to overcome temptation was rooted in his prior commitment to studying the Bible. As Mennonites, it is also important to recall that Jesus reveals a God of love and leads a life of radical, nonviolent obedience based on what we call the “Old Testament,” but for him were the only Scriptures he ever had. As we seek to follow Jesus, we also need to immerse ourselves and our communities in studying the whole Bible, and not just the New Testament. Never before has the Bible been so accessible, or have we been so literate and educated, or have had so much time away from providing the basic necessities of life. And has there ever been a time in the Mennonite tradition when Scripture has received less attention? How could illiterate Anabaptists in the 16th century stand before judges and respond to accusations by quoting Scripture? Could we? I also strongly affirm the idea of a “priesthood of all believers.” However, this reflects increased responsibility and commitment on each of us, not less. Where some Christian traditions in the Reformation suggested that biblical interpretation be left “to the experts,” this was fundamentally challenged by the Anabaptists. But now we are in danger of creating a new “magisterium,” only this time they are university professors, preaching/teaching pastors or Sunday school curriculum writers, that we sub-contract to interact with the Bible on our behalf. But can a “priesthood of all believers” model survive such a shift? What about our understanding and commitment to justice, peace and community? A number of years ago our family visited Ithaca, N.Y., where I wandered into a used book store and found a great illustrated children’s Bible. After buying it and putting it in the backseat, we noticed that our six-year-old daughter, Zoe, had picked it up and started to read. For the next five hours we heard her chuckling at different points as we periodically called back, asking what story she was on now or which was her favourite so far. As we arrived in Waterloo, Ont., she had almost read through the Old Testament section. The next morning she woke up and finished reading her New Testament by noon. Completely unprompted, in two days Zoe read her entire picture Bible—all 437 pages—and enjoyed it! At St. Jacobs Mennonite Church, Ont., we give children a Bible as they enter Grade 3. When Zoe received hers, I thought about her in the backseat returning from Ithaca. We did not ask her to read; she simply picked up a Bible and thought it was interesting. She had clearly not yet learned that the Bible is boring, out-of-date or irrelevant. How long will this interest last? Will our family and our church foster or destroy this sense of discovery and enjoyment of Scripture? As our congregations hand out Bibles to children, what message do we send? Is this a symbol, a thick plaque that will gather dust for years to come? Is it an individualistic “here it is, good luck making any sense of it”? Or does this gift represent an invitation to join a discerning community committed to wrestling with this document, convinced that God’s blessing is waiting for us within its pages? Jesus’ temptation challenges us to move beyond “proof texts,” not by dropping the Bible and moving elsewhere, but by committing ourselves to wrestle with it. While God’s blessing is not automatic, enabled by the Spirit and immersed in Scripture Jesus overcomes his temptations. And we, too, may well find that engaging Scripture together with expectation and openness can be funny, energizing and even life-changing. Like Jesus, our identity as his followers is closely linked to the Bible. But Scripture is not a Christian version of Aladdin’s lamp, which we just pick up and out pops God’s will for us. But then again, this is not its purpose. Rather, as Jacob and Jesus demonstrate, perhaps wrestling with God and the divine will for our lives should be a struggle. The question is: Are we committed to doing so? Derek Suderman teaches religious studies (Old Testament) at Conrad Grebel University College, Waterloo, Ont., and the University of Waterloo. This feature article is based on a sermon preached at Rockway Mennonite Church, Jan. 6, 2013.